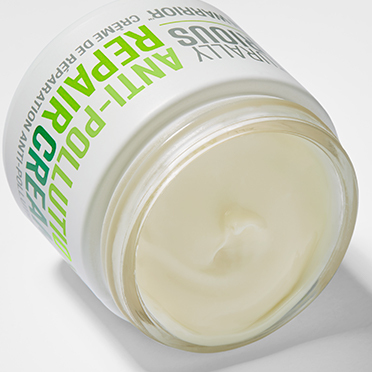 A powerful daily cream that builds skins moisture barrier to help defend against pollution and the look of premature aging. Reverse + restore + defend. Hear our battle cry! Build your moisture barrier to shield skin from aging pollutants with this powerful daily cream that contains apple extract, hyaluronic acid, squalane and bisabolol for next-level hydration. Allantoin and hyaluronic acid help lock in moisture and nutrients, while magnolia and mangosteen extracts target inflammation and help defend against environmental skin damage and premature aging. Utilizes a patented Anti-Pollution Blend of 6 anti-oxidants (pomegranate, goji berry, grape seed, green tea, red tea and white tea) to help combat visible signs of aging caused by UV rays, pollution, free radical damage and other environmental aggressors. An exclusive Active Rescue Complex (edelweiss, imperatoria, swiss stone pine and ViaPure Coleus) helps promote natural cell renewal for healthier, radiant-looking skin. Work to soften and soothe dry, dehydrated skin adding a protective layer to the skin’s surface to help seal in moisture. Highly potent anti-oxidants and effectively help prevent skin damage and premature aging. Our patented blend of 6 anti-oxidants (pomegranate, goji berry, grape seed, green tea, red tea, and white tea) is clinically tested to combat visible signs of aging caused by UV rays, pollution, and free radical damage. Water/Aqua/Eau, Butyrospermum Parkii (Shea) Butter, Glycerin, Pyrus Malus (Apple) Fruit Extract, Simmondsia Chinensis (Jojoba) Seed Oil, Hydrogenated Sunflower Seed Oil Polyglyceryl-3 Esters, Jojoba Esters, Undecane, Cetyl Alcohol, Caprylic/Capric Triglyceride, Propanediol, Tridecane, Bisabolol, Squalane, Pentylene Glycol, Caffeine, Aspalathus Linearis Leaf Extract, Camellia Sinensis Leaf Extract, Lycium Barbarum Fruit Extract, Punica Granatum Extract, Vitis Vinifera (Grape) Seed Extract, Leuconostoc/Radish Root Ferment Filtrate, Pinus Cembra Wood Extract, Betula Alba Bark Extract, Garcinia Mangostana Peel Extract, Magnolia Officinalis Bark Extract, Colloidal Oatmeal, Allantoin, Ceramide NP, Sodium Hyaluronate, Tocopheryl Acetate, Tocopherol, Theobroma Cacao (Cocoa) Seed Butter, Cera Alba (Beeswax), Coleus Barbatus Root Extract, Leontopodium Alpinum Extract, Peucedanum Ostruthium Leaf Extract, Helianthus Annuus (Sunflower) Seed Oil, Hydrogenated Sunflower Seed Oil Glyceryl Esters, Sodium Phytate, Sodium Stearoyl Lactylate, Cetearyl Alcohol, Maltodextrin, Citric Acid, Xanthan Gum, Phenethyl Alcohol, Limonene, Linalool, Citral, Citronellol, Geraniol, Fragrance/Parfum*. Apply to clean, dry skin or over serum in the A.M. and P.M.
An advanced eye cream that reduces the look of fine lines, dark circles and puffiness while protecting the eye area from aging pollutants.